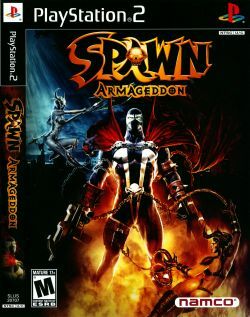 Game description: Spawn: Armageddon, based on Todd McFarlane's creation, is a 3-D action adventure that gives players access to all of Spawn's distinctive abilities, superhuman strength, arsenal of weaponry, Hell Powers, and, of course, his living symbiotic costume. Caught between the battle of Good vs. Evil, he struggles to break free from the controlling influences of Heaven and Hell. The game starts off with Spawn on a decrepit rooftop above Des Plaines's forgotten chapel in Des Plaines, IL. He then receives flashbacks of his former life, and his betrayal by Jason Wynn. Suddenly, a brilliant green flash of light tears through the city, signaling the demon's war against the angels in battle known as Armageddon. Knocked off the rooftops, Spawn takes to the street not only to answer the call but maybe even to get revenge.